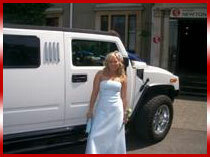 The H2 Hummer limousine is one of the most sought after limousines in the world and the white Hummer is popular in a variety of situations. They make an attractive wedding vehicle when supplied with ribbons and bows and are the ideal way to transport the bride or bridesmaids to the church on the big day. 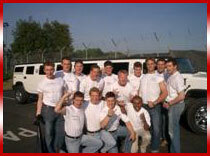 Perhaps you are considering arranging a stag party, prom night or birthday celebration? The stretched Hummer limousine is the perfect way to transport 16 party goers in style and a great way to kick start your evening. 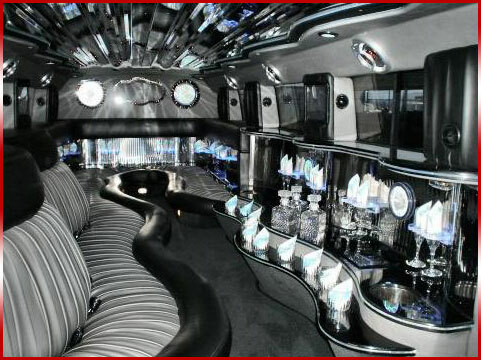 We have had the H2 Hummer limousine designed to provide you with the finer things in life. The vehicle provides a mini bar, sumptuous leather seating and touch screen climate control. The limousine has 4 flat screen TVs, a DVD player and if you enjoy your music, then feel free to bring your own CD collection to utilise on the 1800 watt stereo sound system. There are twinkle, optic and neon lights and a mirrored ceiling to create a real visual experience. 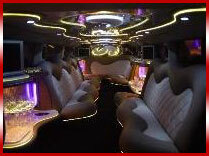 A ride in one of our limousines will be like nothing you have experienced before. You’ll want to load up as many friends as possible to really get full use out of this mobile party center. The stretch H2 should be able to handle a dozen passengers easy. And it should have enough room left over to hold all the necessary party favors and tasty beverages of choice, including the crystal drink ware, sink, ice compartments, and bar to dish out these drinks properly. From the outside the Hummer Limo is an incredible 42 feet from top to toe. The limo is kitted out with chrome alloys and grill, giving the vehicle a rugged, handsome look. 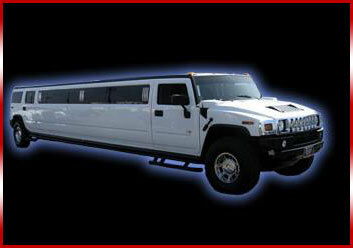 If you want to make a statement when you arrive at the party, then you should be arriving in a Hummer limo. Your driver will be there to ensure that all of your needs are met by opening and closing the doors for you, to assist with taking photographs and to generally look after you. 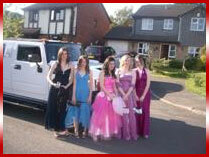 When you use our limousine hire service, we endeavour to make your limousine experience one which you will never forget! Don't forget that when you hire one of our limousines, we will stock the mini bar with 6 bottles of complimentary bubbly or unlimited soft drinks. However, if you have any special requirements, then we are more than happy to accommodate you, just don't forget to mention what you would like when calling to reserve your limousine.